Again this is another installer fix - perhaps I shouldn't be making code changes after 2.30am and I might make less errors... Thanks to reader Timothy for pointing out another flaw! There are no other changes to the Aerofoil itself (it still has version 1.5.0 in its About box). - Fixed installer to set auto mute option correctly which was always switched on in Aerofoil 1.5.0_02. An idea: you should develop: "Auto Black screen" when you're using battery! Nice program. Tnx for coding. But what about the adware alert f-secure and kaspersky (7.0.0.125) brings up when scanning setup_1.5.0_03.exe, false positive? Anonymous - thanks for the heads up. As far as I can tell the download you've got of Aerofoil 1.5.0_03 is virus free according to AVG and AntiMalwareBytes (with defs from 9/3/2010) - I've also confirmed the same md5sum here. I'll email both f-secure and kaspersky this evening to try and get this rectified and post back in the comments. The false positives probably come from using UPX to compress the actual Aerofoil binary files inside the installer file (this makes Aerofoil even smaller on disk). Kaspersky and F-Secure have been made aware of the false positive - "A user of my popular open source laptop program has stated that Kaspersky Antivirus is giving a false positive - probably because it is zip file wrapping a NSIS installer that copies a UPX based file (the main application). The source code (and compiled UPX compressed executable - attached anyway) is available from www.silentdevelopment.co.uk if you want to compile it you"ll also need Visual Studio 2008 Express + WxWidgets 2.8.8." "Auto Black screen" when you're using battery!" Unfortunately this would not save power as most screens (not CRTs) still use power whether they put out white or black the only difference is light colour. Thank you for contacting the antivirus developers. Both programs don't grump anymore. Installed your program, using Windows 7 64bit. 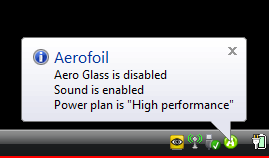 When disabling aero glass using aerofoil, the OS reports an error that aerofoil.exe executed an action that forced the os to switch to Windows7-Basic. Is there any better way to tell the OS to disable Aero? The OS message could be disabled, so no problem in the end. Besides this the program works like a charm. Again, tnx for coding and sharing.